Caccavelle pasta alla Sorrentina is a flavourful and rich traditional baked pasta recipe from Campania, in particular Sorrento. In this version, the pasta is giant 50g pasta shells said to be the biggest pasta in the world! 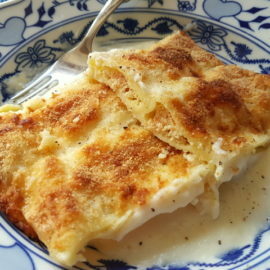 Baked pasta alla Sorrentina is a typical Neapolitan recipe the most famous version of which is gnocchi alla Sorrentina. For the gnocchi version, potato gnocchi are baked in a tomato sauce with mozzarella and basil. However, there are a number of different ‘alla sorrentina’ recipes. Many Italians also serve other types of pasta this way and I have found recipes for paccheri, strozzapreti, scialatielli and fusilli alla Sorrentina; either al forno (baked) or served without baking. 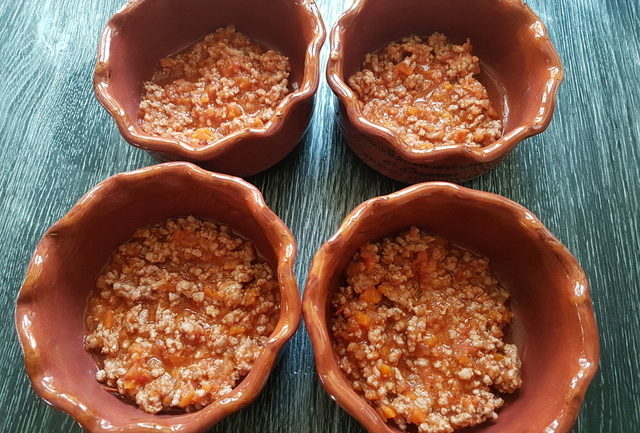 In addition, there are ‘alla Sorrentina’ recipes that include meat. These are most often those made with filled pasta such as cannelloni (manicotti) or conchiglioni. This caccavelle pasta alla Sorrentina recipe includes meat and could also be made with conchiglioni instead of caccavelle. Caccavelle giant pasta shells from Gragnano. As I mentioned above caccavelle are giant pasta shells which weigh 50 grams each. It seems that they are made by only one company; The Gragnano Pasta Factory in Gragnano, near Naples. You can read more about caccavelle and pasta di Gragnano if you click here! I bought this pasta online and as far as I know you can order it through the producers or online Italian food retailers. 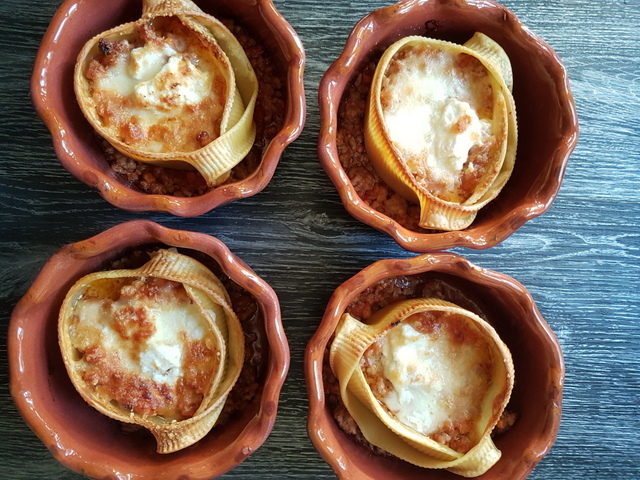 Caccavelle are usually cooked in individual glazed terracotta pots. In fact, the word ‘caccavelle’ means ‘pots’ in Neapolitan dialect. 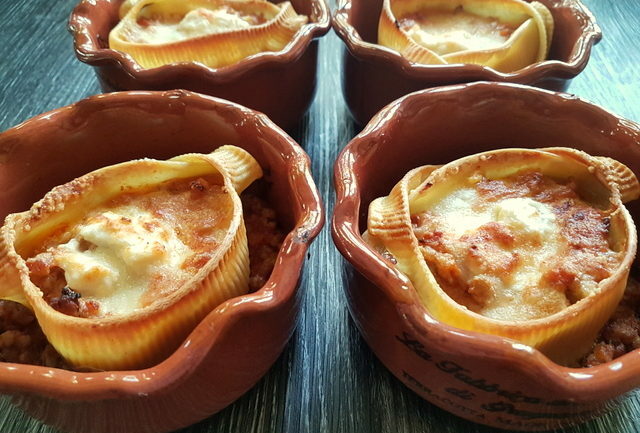 I’m not sure if the name derives from the fact that these large pasta pieces look like little pots or because they’re traditionally cooked in little pots! Either way, when I ordered this pasta online, I also bought the typical terracotta pots to cook the dish in. However, you can bake these giant shells in one large oven dish or use small individual oven to tableware. Making this Caccavelle alla Sorrentina recipe. 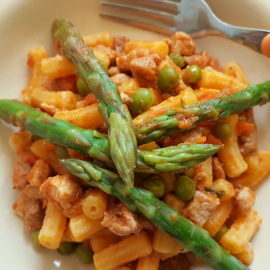 Like many other Italian al forno recipes, this caccavelle pasta alla Sorrentina takes a little while to make as it includes a meat ragu which has to be made first. These kinds of dishes are usually eaten on Sundays or holidays in Italy because they are more time consuming to prepare. Having said that, they are well worth the effort and so delicious! Apart from the ingredients needed to make the meat ragu this caccavelle pasta alla Sorrentina includes some fresh mozzarella, fresh ricotta and grated Pecorino or Parmigiano Reggiano. Because the caccavelle are large, they have to be pre-boiled before assembling the final dish and baking it. 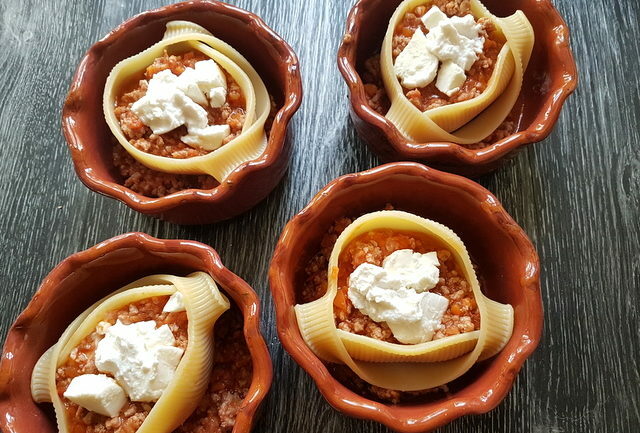 Each giant pasta shell is then filled with a layer of ragu, then some mozzarella and ricotta, another layer of ragu, mozzarella and ricotta and finally the grated parmigiana. 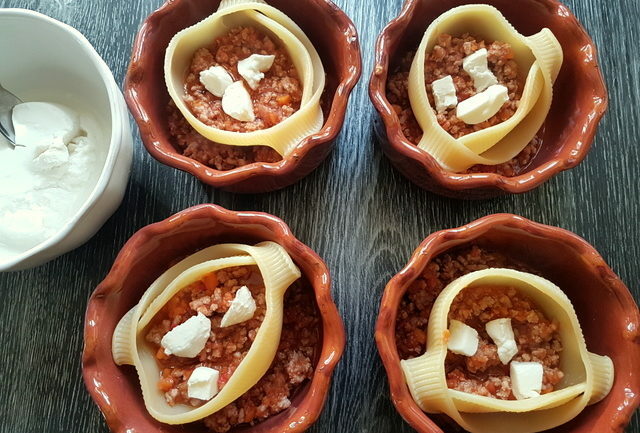 If serving in individual portions you can leave the caccavelle in their pots. Otherwise plate with some of the sauce from the bottom of the dish. Whichever way you serve this recipe, I’m sure you’re going to fall in love with this dish AND the pasta. 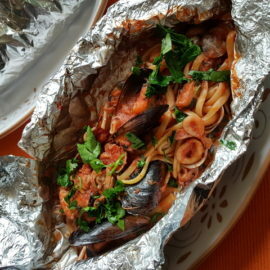 If you make this caccavelle alla Sorrentina recipe, I’d love to hear how it turns out. Please write a comment here on the blog or post a comment on the Pasta Project Facebook page. 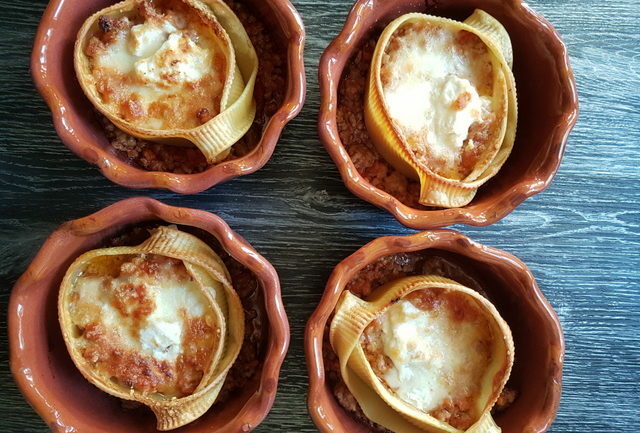 This delicious Neapolitan baked pasta recipe is made with the biggest pasta in the world filled with meat ragu and cheese and baked in the oven. Perfect for Sunday lunch and holiday menus. 1 Lt tomato passata (33floz) I use Cirio rustica which is thicker. 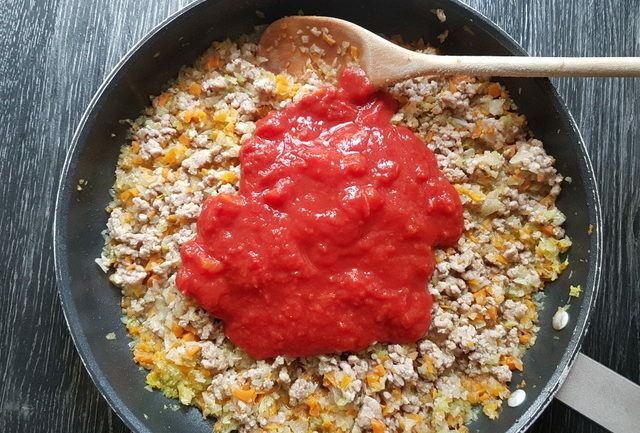 Start preparing the minced meat ragu which is the main part of the caccavelle filling. 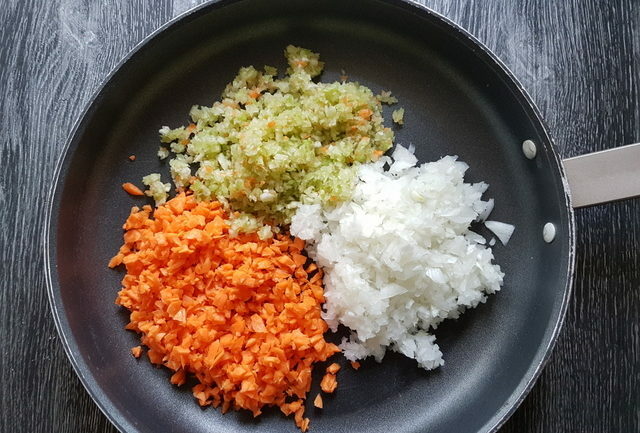 Wash and finely chop the celery and carrot. Peel the onion and chop finely too. Heat the olive oil in a deep frying pan or skillet and soften the chopped vegetables in the heated oil. 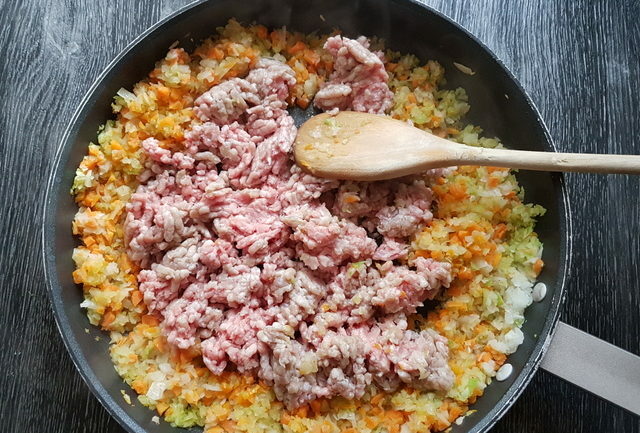 Then add the minced meat and brown it. Use a wooden spoon to separate and mix it. When the meat has browned add the white wine. Let the alcohol evaporate and then add the tomato passata. Mix everything together well. Add salt and pepper to taste. Lower the heat and simmer covered for at least 30 minutes. The longer you cook the ragu, the better it tastes. In the meantime, put a large pot of water on to boil for the pasta. Add salt once it starts to boil and bring to the boil again. Cook the caccavelle until they are al dente. Usually about 10-2 minutes. Save a cup of the pasta cooking water. Drain the pasta. Make sure there’s no water inside the pasta shells. 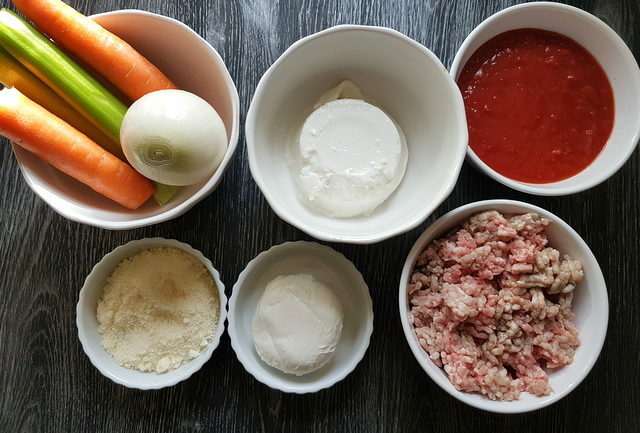 Cut the mozzarella and ricotta into small pieces. If your sauce is too dry, add some of the saved pasta cooking water and mix. Put a little sauce in each individual small oven dish. 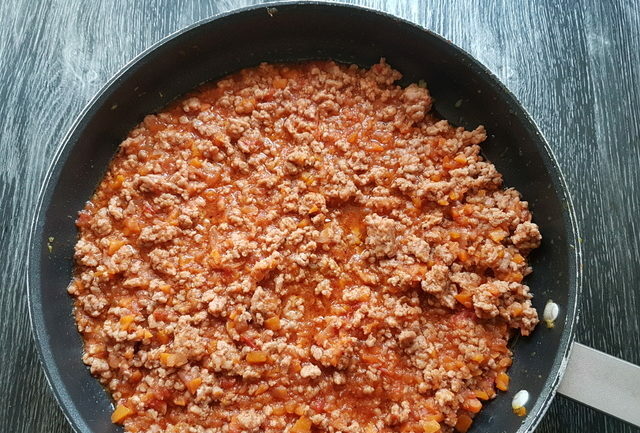 Place a caccavella in each pan and fill the pasta shell half way with some meat sauce. Add the diced mozzarella and a little ricotta. Cover with more sauce, then add more mozzarella, ricotta and again ragu. Finally sprinkle with grated Parmigiano. Bake the caccavelle in a preheated oven at 180 degrees for 30 minutes. Serve immediately. If you don't have caccavelle you can make this recipe with other large pasta shells such as conchiglioni or lumaconi. The sauce needs to be quite liquidy as the pasta will absorb it and you don't want it to dry out. I have never seen shells that big! i am going to use your link to buy some! I know my family love them! I also love the way you add all of the vegetables to your sauces! Really bumps up the nutrition! Very Impressive! Can you buy these pasta shells in the USA or on line? These huge pasta shells are so fun! I love the looks of this meal! Thank you so much Kim! I LOVE these pasta shells! I bought more and am looking forward to making more recipes with them! This dish is so amazing! My family requests it over and over again! I agree Carla! My family love these baked shells too! These are darling! 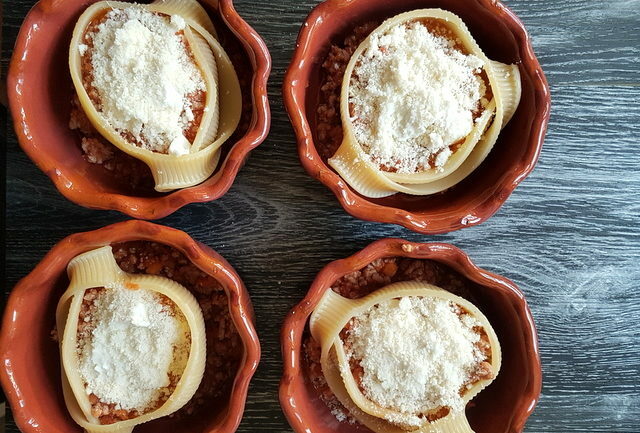 At first I thought they were little bowls made out of pasta, The step-by-step photos make this recipe so easy to follow. Thank you Annissa! Well the pasta does actually look like little bowls! I love serving them in those individual bowls though. It looks fabulous! WOW! Those are some amazing looking pasta shells. I love the sound of this recipe! Grazie Cliona! 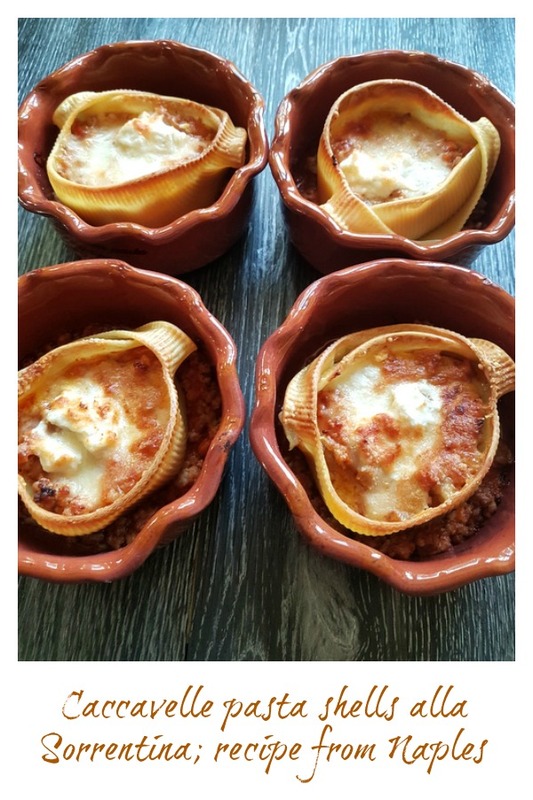 Yes these giant pasta shells are unique and this recipe is so yummy! I can’t wait to try some different recipes with these pasta shells too! I love this pasta shape. 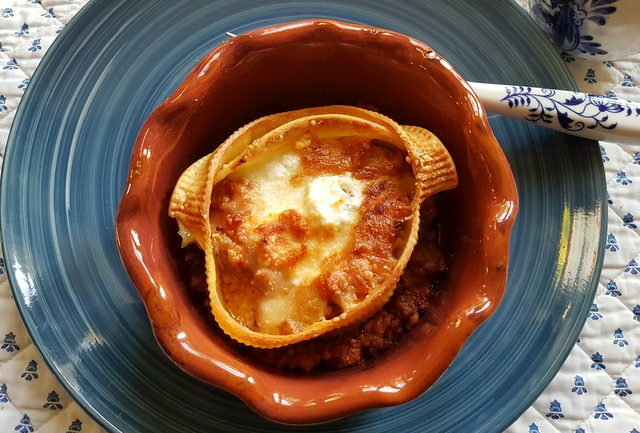 So neat that it makes individual bowls filled with meaty and cheesy goodness. My kids would think these are so fun! I love this pasta too Jill. And serving it in individual bowls is very cool! I’m sure your kids would love this for dinner! Oh my goodness, I love how these are served in those adorable individual dishes! What a fantastic presentation for entertaining- or eating on the couch, haha! 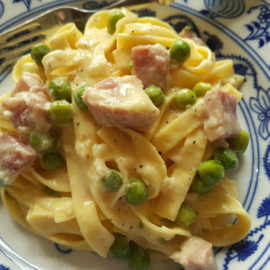 Love anything “alla sorrentina” and definitely loving this recipe. Aren’t they wonderful Monica? I’m totally in love with these pasta shells in their individual bowls. Can’t wait to try some other recipes with them in the New Year! This looks like total comfort food! I know my family will love this! I have never had this type of pasta, but wow does it look good! I can’t wait to try this recipe! This looks so good! I am a big fan of pasta and this looks like a dish I certainly need to try! 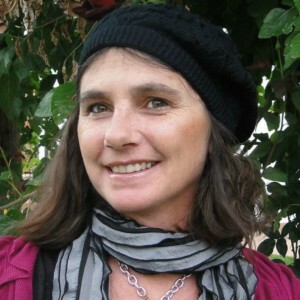 Grazie cara Claudia! I’m happy you like my blog and this recipe. I also love the way these giant pasta shells can be cooked and served as individual portions! Yes, this would make a great holiday dish! Merry Christmas and Happy New Year to you too. Un abbraccio!